Why Work at Ark John Keats Academy? Ark John Keats Academy provides pupils from Nursery to 6th Form with a world class standard of education. We currently have 1400 pupils on roll from Nursery to Year 5 and in Years 7 to 11. The academy will reach full capacity in 2020 with just under two thousand pupils. We have been graded outstanding in all areas by Ofsted. We have created an academy that is renowned for its’ calm, orderly and purposeful environment and where pupils make exceptional progress and behave maturely and respectfully. New staff will be joining a school with a wonderful ethos, where academy staff, pupils and parents are incredibly aligned, committed and passionate about our school. Pupils are provided with a first class education and we are intent on developing a school that will match the very best in both the state and private sectors and is a source of pride for the people of north east Enfield. Our approach is underpinned by six pillars – A Mastery Curriculum, High Quality Teaching, Strong Discipline, Character Development, Raising Aspirations & Enrichment and Developing Education Leaders. Our curriculum is academic, it is planned on the basis of preparing pupils for the best universities and emphasises mastery of knowledge and skills. Our teaching staff are experts in their subject areas and all staff at the academy share a commitment to the highest expectations. We have developed a Character programme to support the development of good character so pupils can engage in the school, community and the global world with courage, tenacity, altruism and reflectiveness. We ensure pupils develop wider interests and passions and our pupils have access to over 40 enrichment activities, ranging from chess and coding to football and political art. We support pupils in raising their aspirations by helping them understand the structure, importance and value of school. We inspire their thinking about their futures through university and workplace visits and through our Digest speaker programme, where visitors speak to pupils about their career choices and educational experiences. We provide staff with very high quality and regular CPD. 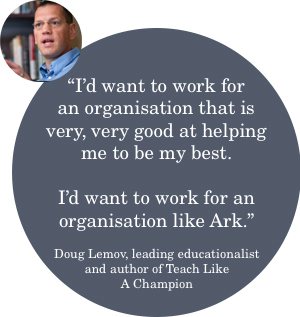 All teachers and leaders have weekly coaching, a weekly whole staff training session, 14 CPD days annually and access to an extensive menu of Ark training programmes for all levels. Train to teach at Ark John Keats.